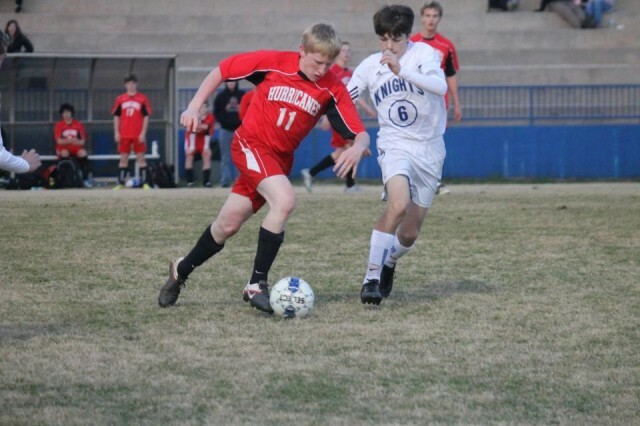 Hurricane Sports offers soccer in the spring. The sport is offered for home schooled students, as well as traditionally schooled students whose school does not offer soccer. Our season is open for boys and girls at the JV, Varsity levels and Middle School levels. Teams will be filled in the following order: Varsity, Junior Varsity, and Middle School. Tryouts begin the end of January, followed by registration the first part of February. Games begin the middle part of February and continue until the first part of May. Games are generally no further than 1 hour away, and it is the parents' responsibility to get their athlete to the games, although car pooling is encouraged and often available. Greenville Hurricanes is pleased to announce our Spring 2019 Soccer tryouts. Please read all the information below and e-mail us with any questions. How many of the tryout dates do I need to attend? Players should attend as many tryout dates as possible for an adequate evaluation. If returning players have conflicts with the tryout dates, they need to make tryout arrangements with the coaches. Our intent is to announce teams on Saturday 12th, so please attend the earliest available tryouts in case of poor January weather. We will be holding tryouts on fields outside of the Pavilion (400 Scottswood Rd, Taylors). Players are encouraged to arrive early. Tryouts will begin promptly at 6pm (Girls) and 6:30pm (Boys) with organized warmups and stretching. Will there be someone to answer questions? The coaching staff will be available for player/parent questions after tryouts, but there will also be administrative personnel at the fields. What teams will be offered this spring? We've had a large tryout participation over the last few seasons, and we are expecting the same this season for both our young men's and young women's teams. Varsity games have been scheduled, and based on player/coach availability, teams will be filled in the following order: Varsity, Junior Varsity, and Middle School. All potential Hurricane and future Hurricane players are encouraged to attend the tryouts. We have used Middle School players on our JV and Varsity teams in the past. However, please be aware that the Junior Varsity teams of our opponents will have 9th & 10th graders on their teams. What are the recommended ages for tryouts? What is the Registration Information? Registration and Initial Team Meeting will be held on Monday, January 14th at Grace Taylors/Espanol (2701 Wade Hampton Blvd, Greenville - formerly Cornerstone Church) from 7:00-8:30 p.m. We will have everyone finish registration and sign-up for the first 30 minutes. We will officially kick-off the season with some information sharing from the leadership team. Costs will be $275 for the Varsity teams and $225 for the JV teams. If we are able to field MS teams, cost is TBD. If you did not purchase a uniform last season, you will need to purchase one. The cost of the uniform kit is approximately $100. There may be some gently used uniforms available from the past seasons. Please let us know if you have a uniform from last season for sale. If possible, please bring to our meeting and you may be able to sell to another family in attendance. Payment Plan - For those families that would benefit from a payment plan, information is below. Please note that if you choose to use the payment plan, all post-dated checks are due at registration. We are pleased to announce our Spring 2018 Soccer Kick Arounds. Please read all the information below and e-mail us with any questions. Playing soccer for love of game without expectations or pressure. Players can use time to either decompress from their Fall soccer seasons or they can use this as an opportunity to shake off the rust. It is also a time to reconnect (or connect) with the Hurricane Soccer community. Who can attend the Kick Arounds? We are inviting all 6th to12th grade soccer players interested (or slightly interested) in playing Hurricane Soccer in the Spring. We will organize games taking into account player size and skill. We also encourage alumni to come and join. Where will Kick Arounds be held? We will be holding kick arounds at the The Pavilion (400 Scottswood Road, Taylors). What should I bring to kick arounds? Please bring shin guards, indoor athletic or soccer shoes, and drinking water. All players are required to wear shin guards during kick arounds. Costs will be only $10 per event. This will help defer the cost of the rental and keep our season registration’s cost low.